Mr. Chris Draper, the sole British candidate amongst three American candidates, obtained his education at Watford Grammar School, the U.K. He then got his Master’s degree in Natural Sciences, Chemistry, and his Postgraduate Certificate in Education at Jesus College, U.K.
His prior work experiences include teaching extensively in the U.K in schools such as Colchester Royal Grammar School, Tiffin Girls School, and Aylesbury Grammar School. 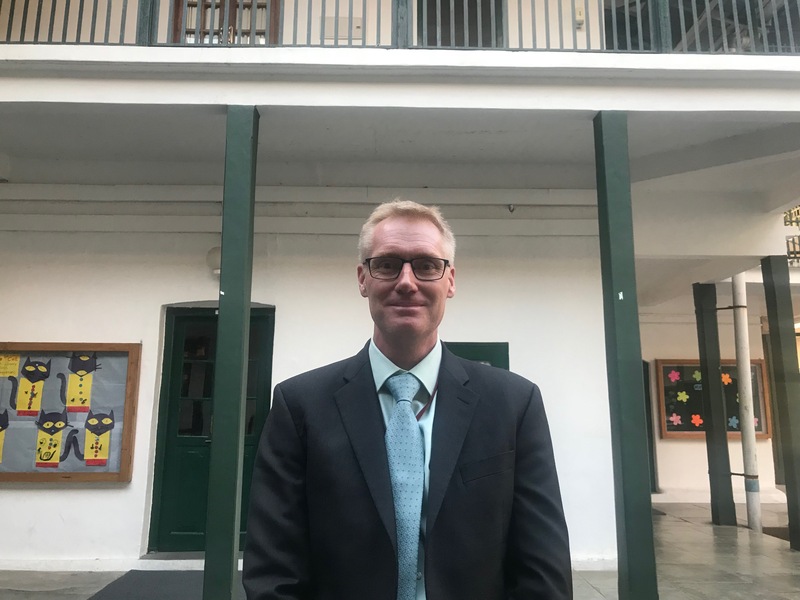 He also has international work experiences in Kenya, as Deputy of Headmaster and Senior Chemistry Teacher at St. Andrew’s school, Egypt, and as teacher and Director of Learning at New Cairo British International school. He also worked in Malaysia as the Assistant Principal and Acting Principal at Alice Smith International School. At the CFI session held on April. 1, 2019, Mr. Draper emphasized that where he is now is because he had converted to Christianity at the age of 13. He said that everyone “owed their existence to these seemingly random events.” He gave the example of his own existence. His grandfather had fought during the World War and had been one of the sole survivors in his neighborhood by chance, which eventually led to his existence. And since then, a succession of chance and random events has led to where he is now. However, he believes that these random events are a part of a bigger plan set by God. In his previous school, he asked the question, “What if we could get students into top universities regularly?” He called this the 2020 vision, which aimed to admit 20 students into the best universities, and it was accomplished. Hence, with the help of some missionary sponsors who flew students to a village in Kenya, he was able to provide medical help to babies at a critical time. They saved many lives. He said that this was one of the most “transformative” experiences he has ever had. When asked about why he had applied for the job, he replied that the values and mission of the school aligned with his personal values. “That’s what we’d write for our kids,” he said. Doubts on his strong Christian faith in this multicultural community were also well addressed by him. He said that he does not seek to be a “missionary” in his professional career. He believes that the school being a Christian school does not preclude any other religious groups from expressing themselves. He had a strong emphasis on his faith throughout his talk as he believed it to be a core part of his identity, similarly, he believes the right for everyone to speak up for their own beliefs.